The Mutanimals are half way to completing the Path of the Four Winds, where they will meet the Dragon of the North and discover the ancient wisdom it holds. Meanwhile, Jagwar’s mother, Juntarra, tries to escape from Death’s desert stronghold, but is captured by Null. The next day, the Mutanimals renew their trek and soon discover a work camp, where men are being enslaved and forced to strip mine the area. Enraged by both the environmental damage and the evil of slavery, the mutants attack. 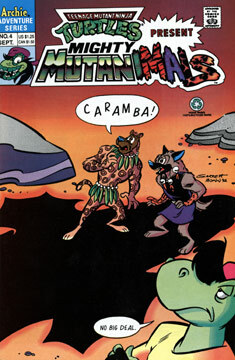 After a short battle, the Mutanimals are victorious, and Jagwar tells the slaves that they are free. Later, our heroes arrive at a mountain cave in the desert and are greeted by the Dragon of the North, whose name is Glyph. The Mutanimals note a junkyard in the valley below, and the ancient reptile begins his story. Glyph explains that two alien races had arrived on one of Jupiter’s moons four billion years ago, and immediately started a war with one another over the satellite’s resources. Eventually one side used its weapons of mass destruction to destroy their enemy – but in the process, they destroyed most of their own troops along with the moon itself. A few remaining ships continued the war across the galaxy, until they arrived at the planet Earth – where one alien was victorious, none other than the “dragon” Glyph. The junkyard below is actually the remains of the final battle between the two warring states. The next day, the Mutanimals ponder the meaning of the dragon’s tale as they search the ship graveyard for weapons to fight Null and his minions. After a successful search, out heroes set out on the final leg of their journey, where they are met by a shape-shifter (transofrming herself from an eagle to a human woman) named Azrael. The woman welcomes the Mutanimals to the East, the last path of their endeavor.